After thinking a bit more about all of this the most remarkable thing was auditory. · The silence of curfew—no cars, no hum of street lamps, no voices. This is a photo of my fence. The wind rocked the posts back and forth so that there is over eight inches of excursion. I watched the neighbor’s fence undulating until it finally collapsed. It was an interesting variation of ‘the wave’ at sporting events. Yes, that is a large hunk of concrete around the post. 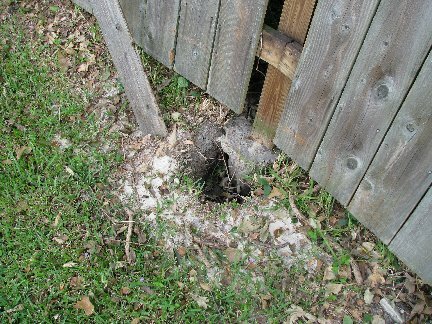 Each post has been propped up with a T-post until I can find a fence-mender and the insurance adjustor visits. Sound always leaves a very powerful impression on me as well. But perhaps silence is even more immense. It seems to fill more space, externally and internally.